It isn’t enough for the water to fall off your roof. Once your roof sheds water, that water must be taken away from your house. Why? Because water can ruin your house from above or below. Water leaks into your foundation are just as scary as leaks into your roof – if not more so. Foundation water leaks lead to catastrophic cracks in the foundation. Not only that, water can damage the ground underneath your foundation, causing one part of your home to rise higher than the other. Once the foundation is undermined, the rest of the house suffers all the way up to the roof. Cracks will travel through the floors and the walls, the doors won’t close any more, and the plumbing will have issues. If things get bad enough, your home won’t be habitable any more. Many people don’t seem to realize that the main things standing between their homes and the disaster we just described are pieces of thin metal—the gutters. The gutters work with roofing shingles to collect water and transport it away from the foundation via drain pipes. Keeping your gutters in good repair is not only important, it’s an easy, uncomplicated way to keep your entire home in good shape. 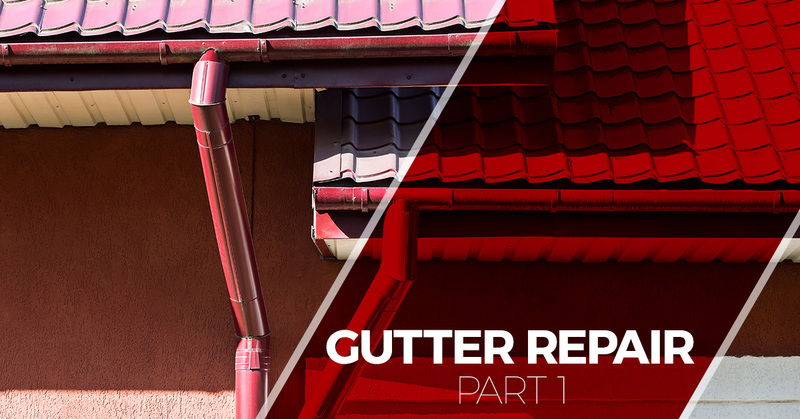 In today’s blog, we are going to share some signs that your gutters need some TLC. We thought we’d start out with the most obvious sign. This one is pretty hard to miss, especially once it has become dangerously advanced. If you see a gutter sagging down away from the house, chances are good that it is heavy with water and debris. At this point, clearing out the gutter is not enough; it will simply load back up again. Things will just get worse from there. Give Tim Leeper Roofing a call and let us help! Both sun and water can make paint peel off of homes. However, if you see paint peeling on or around your gutters, chances are good that water is going places it should not, soaking the wood around the gutters and loosening the paint. Additionally, peeling gutters are usually far past their prime and need to be retired. If you find orange flecks around the opening of your drainage pipes, you’re seeing bits of rust. Rusted gutters are distressed gutters, and it’s only a matter of time before they become useless. If you were to get up on a ladder and look at your gutters, you’d probably find cracks and standing water. Instead, give Tim Leeper Roofing a call. We’ll get up on the ladder, give you a quote, and replace your gutters. At Tim Leeper Roofing, we know it doesn’t matter how well we install a roof if the gutters don’t work. That is why we provide world-class gutter installation and repair. Give us a call in Nashville and let us help you today!